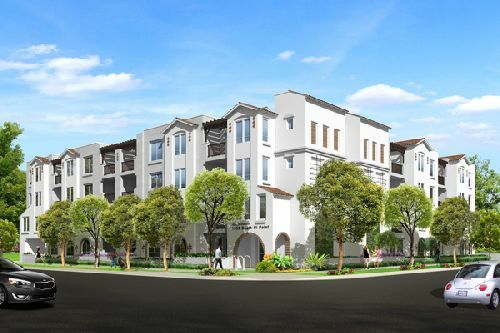 Trion Properties and Kettner Construction have teamed up to develop a 45-unit, luxury multifamily development in L.A.’s Mid-Wilshire neighborhood. Trion recently acquired a fully permitted and entitled 26.9k sf development site for the project and plans to break ground in February. The multifamily community will be located at 1556-1564 Hi Point St. The development site, situated at the corner of Hi Point and Pickford St, was acquired for $8.63 mil. Ten percent of the units will be designated affordable housing. The site is located one mile south of the highly anticipated Wilshire/Fairfax Metro station, scheduled to open in 2023 as part of the Purple Line Subway Extension Project, which will connect residents to major markets from Downtown Los Angeles to the East and Westwood to the West. The site is also one mile away from the I-10 Fwy and a quarter mile away from three major thoroughfares: Fairfax Ave, Crescent Heights Blvd, and Pico Blvd. The Mid-Wilshire neighborhood presents a high quality of life and central Los Angeles location surrounded by highly affluent submarkets, including Beverly Hills, Century City, and Miracle Mile. It also is in close proximity to a variety of other attractions and employment, notes Max Sharkansky, Managing Partner at Trion Properties. Continental Partners arranged a $15 mil construction loan for the project. Richard De La Rosa of KW Commercial Studio City and Christopher Choe of Premier Agent Network represented Trion Properties and Ketter Construction. This is Trion’s second development to be completed in partnership with Ketter Construction. The joint venture partnership broke ground on another multifamily development, located at 5012-5016 South Slauson Ave, in 2016. The apartment community, Fifty Twelve, will be open for occupancy in May and will begin preleasing in March.